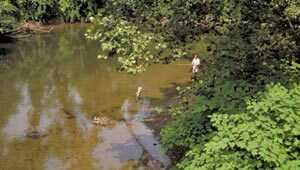 The 90-acre Gateway Property contains the longest natural stretch of the Cuyahoga River within the boundaries of the Cuyahoga Valley National Park, providing important wildlife habitat and resource protection. The Gateway Property is located in Akron at the southern entrance to the National Park directly north of the Bath Road heron rookery. In the spring and early summer, the property provides an ideal viewing spot for watching scores of herons raise their young. Thanks to support from the Akron Community Foundation, the Trust for Public Land worked with the City of Akron to make this valuable resource part of the National Park.